Normally pizza and diets don't go terribly well together, but I have found a way that I can have my cake - or rather pizza – and eat it. And even better, I was able to use up some more leftovers. They don't call me the leftover queen for nothing! When asked about the type of pizza he wanted, my husband's answer was 'Texan Spicy BBQ', so I was tasked with trying to recreate the flavour of his favourite pizza from the take-away. Syn Free on Extra Easy, providing you use the bread and cheese as your Healthy Extra A & B. Heat the oven to 190°C and grease a baking tray. Mix the BBQ sauce with the chilli and sweetener and add the chopped meatloaf. 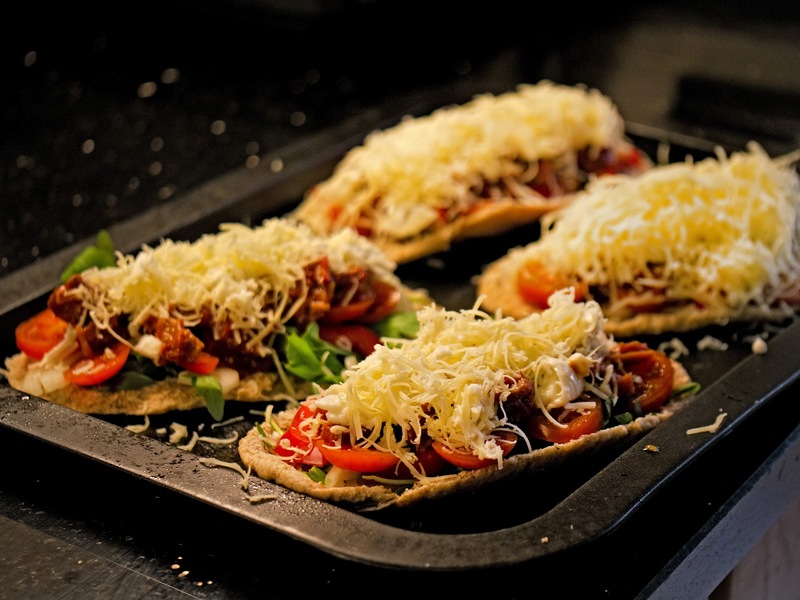 Split the pitta breads open and place all the other ingredients on top, starting with the rocket leaves and finishing with the grated cheese. Bake for 8-10 minutes until the cheese is nicely browned on top. Serve with a salad of your choice. *The Slimming World book says that only Co-Op 60g wholemeal pitta bread is permissible as a Healthy Extra B, but after I had my husband drive half way around the South West looking for a Co-Op which sold them, but to no avail, I decided to use a 60g Sainsbury's wholemeal pitta instead. Seeing as I'm not having any other syns today, I am willing to risk it. ** I used a mixture of mozzarella and low fat cheddar. OK, so it wasn't quite the same as the take-away pizzas, but the taste was very similar. 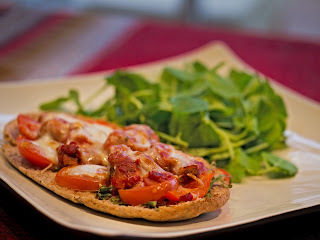 The pitta breads made a good substitute for normal pizza base, and best of all, I can have it on my plan. Definitely one to repeat.